The client- a manufacturing company headquartered in the United States with offices in several countries across the globe. The firm employs over 5000 employees with its operations spread across business areas such as industrial products, processing, and manufacturing. Over the past few years, the client experienced an unexpected surge in employee turnover rate leading to a decline in performance. With the volumes of employee data growing exponentially, organizations would want to devise a concrete methodology to answer important talent management questions. The imperative of making better business decisions faster has, in fact, turned out to be a major challenge that is pressurizing organizations across sectors. In spite of the growing awareness of the power of analytics and data, major HR decisions today, are made using corporate belief systems, intuition, and personal experience. Data-driven decision making involves basing your actions on data rather than experience. 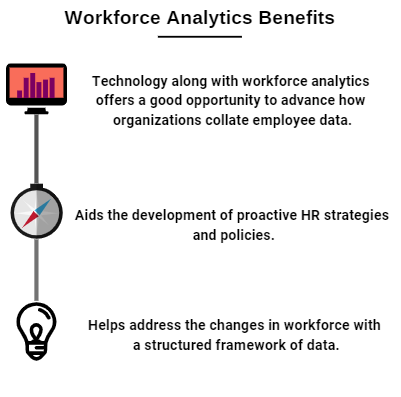 A robust workforce analytics solution empowers organizations to improve organizational performance by optimizing talent utilization. However, in today’s business scenario the practice of leveraging workforce analytics to guide HR decisions remain uncommon. Over the last two years, the manufacturing company faced predicaments in attracting and retaining the workforce, especially those involved in blue-collar production roles. Three-quarters of their total workforce was directly involved in the manufacturing process, with each unit utilizing twenty to thirty hours to assemble the finished product. Voluntary employee turnover, the rise in retirement rates, and mediocre business performance left a huge impact on their overall market value. Owing to such factors the client needed to hire 500 employees for the target role based on replacement hire forecasts and incremental headcount. The cost of replacement per employee was US$ 8,000- tantamount to the attrition cost of US$3 million annually. The huge talent gaps prevented them from achieving their set revenue goals. Challenges such as these presented a high-impact opportunity to leverage workforce analytics and demonstrate its impact on business value by reducing costs incurred in talent management. Businesses today, often believe that they do not possess the data required to develop effective workforce strategies. Without trivializing the notion of the quality and quantity of data needed to leverage workforce analytics, businesses will never know if the data in possession will suffice. However, in this case, the client had a human resource information system from where our experts extracted five years’ worth of transaction data for the target role and examined various factors affecting their decisions. Make better decisions with Quantzig’s workforce analytics solutions. Request a FREE proposal. Phase one of this workforce analytics engagement revolved around collating data extracted from the client’s human resource information system (HRIS) with data obtained from employee-focus group discussions and interviews. Our experts then applied workforce analytics trends to develop several predictive models. The developed models varied in accuracy and complexity, with accuracy ranging from 0% -20%. The best model with precise accuracy was then deployed to predict employee churn. The use of such predictive models helped reveal the compelling factors that led to the employee’s exit from the company. The development of a platform helped analyze recruitment channels with regard to employee turnover and high performing talent. It also helped the client to optimize recruitment strategies and reduce costs. The insights obtained from our workforce analytics model was leveraged to redesign their HR policies and programs. The business leaders involved in this study realized the value of workforce analytics in solving their key challenges associated with employee attrition. Through a small initial investment, a relatively larger business issue was solved using workforce analytics solution. This, in turn, generated sufficient momentum and market value that motivated the client to continue their workforce analytics journey. Workforce data offers a strategic overview that helps employers to effectively manage a high-performing workforce. The data is mostly extracted from a human resource management system that keeps track of huge volumes of employee data. By leveraging workforce data businesses can move a step closer to becoming a high-performing organization. The insights derived from your workforce data if done in the right way could be game-changing. However, without the right workforce analytics tools, businesses usually fly blind, rather than relying on insights that can be obtained from workforce analytics trends. So, what are you waiting for? Draw-up a list of high impact problems and get started on your workforce analytics journey. We’re here to help.